Europe Acetic Acid Market size exceeded UDS 1.8 Billion in 2017 and is expected to grow at 4.3% CAGR from 2018 to 2024. 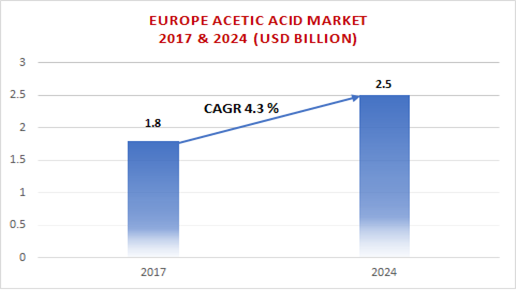 Europe Acetic Acid Market size is likely to grow at a CAGR more than 4.0% during the forecast timeframe. Acetic acid is also used to manufacture chemical contents such as Purified Terephthalic Acid (PTA), acetate esters, Vinyl acetate monomer (VAM) and acetic anhydride. It is used in various industries such as pharmaceutical, rubber, construction, plastics, paint and other industries. It is also used for water treatment and in vinegar as a key ingredient. Vinyl Acetate Monomer (VAM) is a primary intermediate, which is used in the manufacturing of several polymers and resins for adhesives, textiles, paints, coatings, films and other end products. Rapidly growing paints and coating industry in the Europe shall propel the acetic acid market growth in net few years. European paints and coatings industry have grown 5570 thousand tons in 2010 to 6544 thousand tons in 2017. Another major acetic acid application segment in Europe was Purified Terephthalic Acid (PTA). It is used in the polyester products production such as polyethylene terephthalate (PET), polyester fiber, bottle resin, and polyester film. Owing to the application segment PTA is likely to experience good growth numbers in the region. However, acetic acids performance in lower temperature reduces, it has lower compatibility with quarts, corrosive to metals and irritation to skin. It also has an acidic odor. Germany was having the largest market share in Europe acetic acid market. This can be attributed to the increasing water based adhesive market in the region. Many international vendors are operating in the industry, such as Saudi International Petrochemicals, Wacker Chemie, DuPont, Jiangsu Sopo (Group) Co., Ltd., Eastman Chemical Company, British Petroleum, Celanese Corporation, Daicel Corporation, Mitsubishi Chemical Corporation, GNFC Limited, HELM AG, PetroChina, LyondellBasell Industries N.V. and Sinopec.